As a courtesy to knife owners, CRKT® provides replacement parts for most of our models. There is a diagram below for reference when placing your parts order to ensure that you are requesting the correct parts. If your knife has lost other parts than those that are listed below, see the Warranty section for coverage. The Fasteners on most of our knives are Torx #5, #6 or #8. You will need a Torx driver or wrench kit to replace these parts. You can purchase a Torx driver wrench from tool dealers or at hardware stores. Also available through CRKT® is the Get-A-Way Driver Torx (9095). We do not provide blade replacement at this time. Parts Orders may take up to 2 weeks to process. Please allow up to 3 weeks for delivery. To insure timely processing of your parts request, please verify information before submitting. 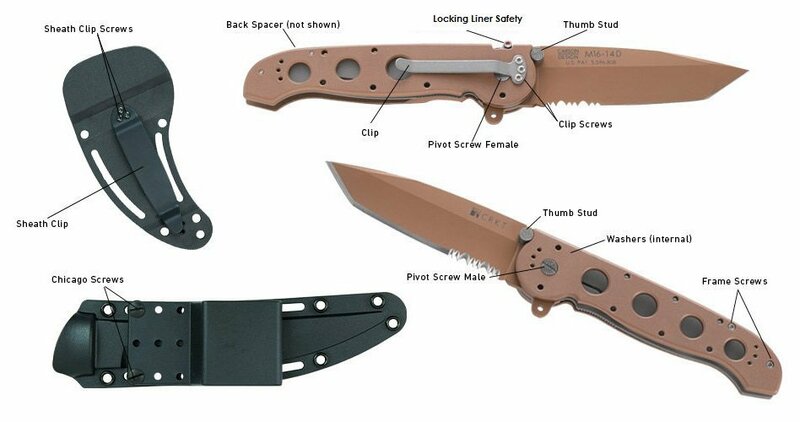 Thumb Stud Set (exclude M16, M21 & M4 series with the exception of G10 models) knife will need to be sent in for warranty. If your needs are not covered by the parts listed above, call CRKT® Customer Service at 1-800-891-3100. Yes, I would like to receive sales or product information in the future, should CRKT® choose to provide it. CRKT® is committed to maintaining your confidence and trust. It is CRKT®'s policy that personal information, such as your name, postal and e-mail address or telephone number, is private and confidential.